Earlier this week we saw Atlus officially reveal Shin Megami Tensei V, previously teased as a new HD game project under development for Nintendo Switch, and the latest Weekly Famitsu magazine has a special coverage on the game. However, while the coverage does not have much specific information about the game itself, there is an extensive interview with producer Kazuyuki Yamai who once again leads the development. 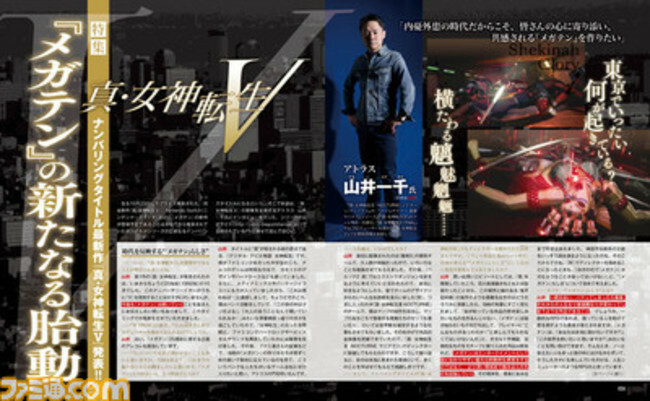 We have fully translated the magazine interview, where Famitsu is able to get some hints on what Shin Megami Tensei V will have while looking back on Yamai's early involvements in Atlus. You can read the interview translation right below. Famitsu: Finally you have declared that Shin Megami Tensei V is under development. Yamai: The first Shin Megami Tensei (SMT) was released this month, October, 25 years ago (in 1992). Unfortunately, we’re unable to fulfill SMTV’s release within this anniversary year, but we have a desire to tell everyone that SMT will still continue from here on, so we made the announcement at this timing. Famitsu: Will Yamai-san still get to work as the producer for SMTV, continuing on from SMTIV Apocalypse? Yamai: Yes. I am also in charge of various projects related to SMT’s 25th anniversary. Famitsu: We think there are still a lot of things about SMTV that you can’t reveal yet, so we’d really like to hear about your history with the SMT series from the past until now. Which title introduced you to SMT for the first time? Yamai: It was Digital Devil Story: Megami Tensei, the origin point which did not have the word Shin added to the title yet. When I was still a NES boy in my middle school years, Namco games had a special existence, and their cassette designs and casings were also elaborate. Furthermore, they also put forth media-mix [promotions] and package illustrations, so I had the feeling of “I have to buy this!”. Right around that time, I was performing in a band, spending my days in the middle of adolescence with [thoughts] like ‘This world is crap’ or ‘I ain’t listening to what adults are saying!’, so I was shocked at Megami Tensei’s sharp world setting and its ability to reproduce hard rock and heavy metal sounds in NES. After that, I once saw the creators of MegaTen at the time dressed in black in a Famitsu interview; that’s when I thought I really wanted to join a game company with punk people like them, so I knocked on Atlus’ door. Famitsu: How was it after you joined the company? Yamai: I was first placed in a development team for Maken X; it had an organization only of a few people, but I could learn about various things. After that in Persona 2: Eternal Punishment I got told I could think freely when working on the extra dungeons. When I did it really freely, I then got a really hectic lecture from the team’s designer afterward (laughs). The next team I joined was for Shin Megami Tensei III: Nocturne; I was in charge of creating maps. I wrote the quotes of demons that appear here and there on the maps, and I would also get the work on supplementing the world's setting. Thanks to that I was able to grasp the whole picture of the title, so I got promoted to the director for Shin Megami Tensei III: Nocturne Maniax. But when I look back like this, I really appreciate that I’ve been in a really desirable environment, learning about a lot of things. Famitsu: And Yamai-san also worked as the director for Shin Megami Tensei IV, but while you were [working] through these successive titles, did you have any discoveries or changes in things that make an SMT according to you? 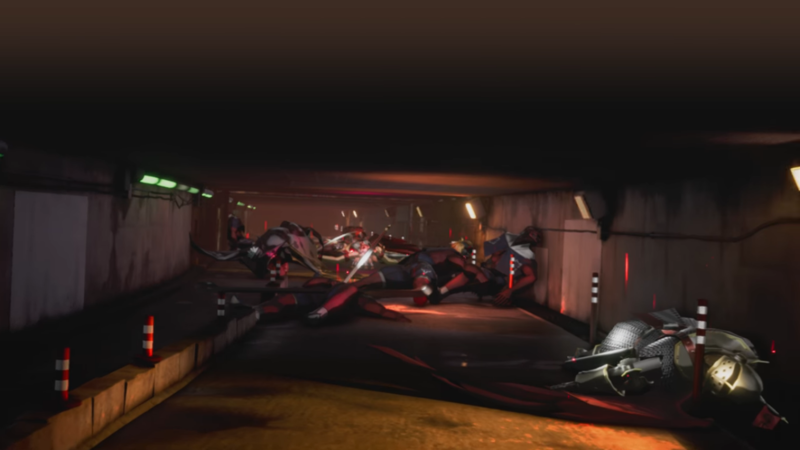 Although there is a number of titles that include occult, myth, or religious motifs, when it comes to SMT, we're not necessarily concerned with surface-level concepts aiming to entertain everyone. Instead, we aim to explore deeper than what's commonly conveyed. That spirit is ingrained deep into our flesh and bones. I also started reading much more literature about mythology and religion around that time. Also, when I got to work as the director for SMTIV, ‘I can’t let SMT sink in my own generation,’ so I thought once again on the things that make an SMT. Famitsu: So, what exactly are the things that make an SMT? Yamai: It may be being a title that once you play it and get hooked to it, it will ultimately coerce reflection on your [real] life and values afterward. In ordinary RPGs, the hero who helps troubled people and destroys evil is considered the good guy. But in SMT, you will be asked things like “Do you really want to rescue them?” or “Do you think you want to save this world?” There ought to be not few people in the world who want to answer 'No', and I think this RPG is like a life simulator that can be enjoyed by such people. Famitsu: As the next numbered title, what kind of title will SMTV be like? Yamai: This will also include my own personal opinion, but if we consider the first Shin Megami Tensei as the start, SMTII took an expansion route with things like broadening the mythologies and religions that serve as motifs and adding more demons, and in its climax you’d fight against an opponent that’s on the level of a universe creator, so in a way, SMTII already expanded the series greatly. Then we were going deeper into the inner space with things like making SMT if… or using the opportunity to make spin-off series like Devil Summoner and Persona. And in SMTIII, if I had to say it, we aimed not for the title’s volume but rather to revolutionize the quality. It was filled with challenges like breaking away from LAW and CHAOS or implementing the Magatama system. After going through this flow, in SMTIV you could say we went back to our roots, but I thought to once again take the essence that the first SMT had in a shape that fits the current era. 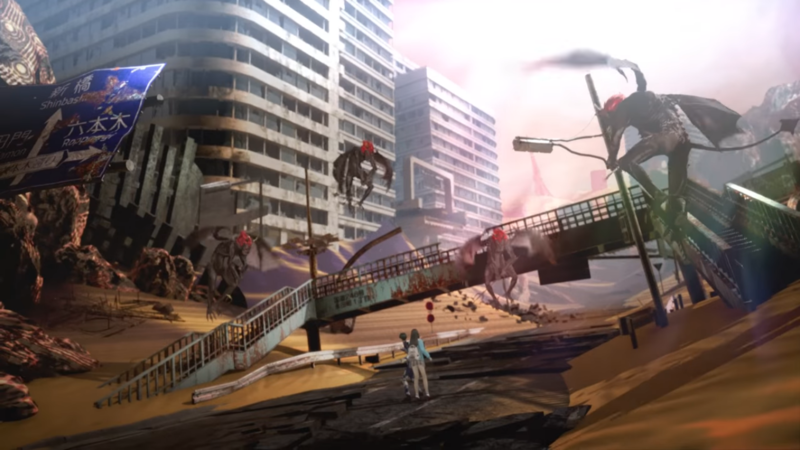 And the direct sequel to that -SMTIV Apocalypse- delves even deeper into SMTIV’s world while also adding the viewpoint of Monotheism vs Polytheism, depicting a new section in the drama between deities, demons, and humans. On top of that, if I am to raise the single direction SMTV is aiming for, it’s to stare back again at the nature of the era. In the past, in the 1990s which was called the End of the Century, there was an occultic hype of ‘could humanity go extinct at this rate?’ And I think some people even had the thought that ‘it’s alright if everything ends like this.’ At that time, the game that appeared to thrust a question of ‘If the world you’re living in now is destroyed, what will you do?’ to people living exactly in that era was SMT. Even in the current 2010s decade that will soon end, there ought to be many people who are frustrated with problems from the inside and outside, such as uncertainty on employment and pension, terrorism, and nuclear weapons. Because we’re in such an era, I want to create an SMT that can empathize with the thoughts everybody’s minds. We want to challenge that with SMTV. Famitsu: If we look at the published PV, there are some intriguing keywords and spots, aren’t there…? Yamai: Yes. For example “Shekinah Glory” can also be literally translated to “God’s Miracle.” These keywords will inflate imaginations in various ways, and I hope everyone will get the true meanings once they actually get to play the game. You may be able to make guesses… like guessing a location by looking at signposts in a city that seems like to have turned into a desert. Or if you take a close look at the crowd of people in Shinagawa station, I think you can catch sight of things like a signboard that reads “To Kyoto” (laughs). Shinagawa is a key point for work/school commuters and tourists and is one of the spots that represent the current Tokyo well, which is used by people of various generations and countries. Of course, it will also get involved in this game’s story. Every scene will have some kind of meaning included in them, so please take a deep look at the PV. 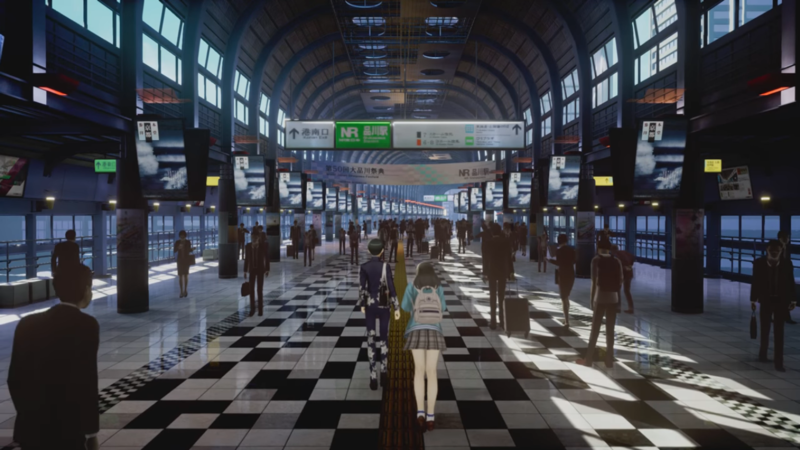 Famitsu: We thought the scene of Shinagawa station was an elaborate cel-shaded anime, but if we take a deeper look, it turns out that it’s CG instead. Yamai: That’s right. As the Unreal Engine logo is displayed in the PV, it’s the first time our company is adopting this powerful game engine. In the past, things created with development tools needed time to be converted (outputted) into the actual game screen, so in the meantime [while the conversion was being processed] we would go out to eat, and when we returned sometimes [the conversion] failed so we had to work all night to convert them again. If we use Unreal Engine, it can be outputted in less than a minute, so the environment for making games has drastically changed. Because when you can check what you’ve made on the game screen instantly, you can take more time to polish ideas or do trial-and-error. Furthermore, this engine has deep capabilities that let us do arrangements unique to us, so I’m really glad we get to implement it. Famitsu: For the supported hardware, what’s your reason to choose Nintendo Switch? Yamai: I felt it again in the middle of the development process, but the Nintendo Switch lets you play games with HD quality graphics on that compact console, and you can also carry it with ease, so it’s a really lovely hardware (laughs). I hope you get to enjoy a gaming life… where you set your back [on a sofa] and play it on TV when progressing the story, and [play it] while lying on the bed when grinding for things such as fusing demons. Famitsu: Oh, you just nonchalantly mentioned Demon Fusions; does that mean such staple features are…? Yamai: Of course while we’re also putting them into SMTV, we’re considering new features as well. It’s an SMT that appears on a home console again after a while, so I’d like to provide a hybrid gameplay that fuses the thick appeals that [mainline] numbered titles up to SMTIII had with the well-received fun of steadily raising [demons] in titles for handhelds like SMTIV. Please look forward to it. Famitsu: We think it’ll still be a while until [you can announce] the release timeframe, but we’re looking forward to the next information batch. Yamai: Thank you. At this point, we’re in a development status where we still can’t say ‘COMING SOON!’, so please wait a bit longer for the more tangible announcements. Shin Megami Tensei V has just been recently revealed by Atlus to be released for Nintendo Switch in Japan. As mentioned in the interview, no release timeframe has been announced as of yet. Check out our earlier article on the game's first official reveal to watch the teaser trailer.